Teaching your dog when the right time to potty is one of every dog owner’s most important initial tasks. There are a variety of methods and techniques, but none of them compare to the attention that you give to your dog. Ultimately, the shortcut is to spend the time with your dog and teach them the right way the first time. The first step is to associate potty time with your command. This will take some time, so you must be patient. Initially, choose a common word, sound, or phrase to associate with potty time. It could be anything you choose, just be sure that it is always repeated and practiced continuously. Don’t start with one phrase and jump to a different word, since it can confuse them and disrupt the process. During this period, you must also begin a schedule. 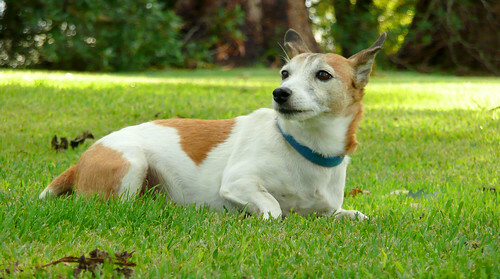 Dogs love habit, and designing a schedule develops a habit that you can control. Feeding and drinking will coincide with potty time, which will be at most an hour right after they’ve had their daily dine. So, you want to develop a schedule for potty time as well. Feed them at regularly scheduled times during the day, and then allow them a chance to potty to create a dependable habit. One of a dog’s instinctive habits is not to potty where they live, eat, or sleep. They will naturally not want to dirty their habitat, which you can take advantage of through crate training. When you’re not around, it can be helpful to confine them to a designated area to prevent accidents that could result in setbacks. One tool that is especially helpful during the training process is the grass litter box. These devices can speed training up, since your dog will be frequently provided a designated potty area where they can relive themselves at will. These can be especially helpful for those that have to go to work during the training process, since your dog won’t have to potty in the house, and you won’t have to make frequent trips to the house during work hours. All it takes is your patience and a few handy techniques to teach your dog when it’s a good time to potty. With some assistance to aid you, you can be sure that your dog can enjoy the freedom they want and you can enjoy the clean house you deserve.